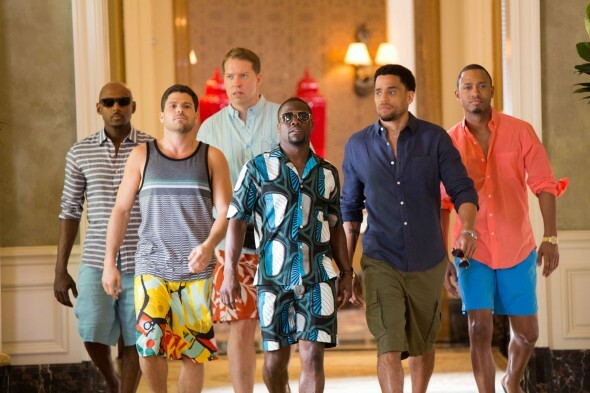 The single most surprising thing about 2012’s Think Like a Man may have been that I did not hate it. The film identifies five potential couples, highlights relationship flaws, then advises the women on how to re-train and trap their men. And yet, as the misguided, sexist, illogical “comedy” unfurled, I began to believe that Kevin Hart could perhaps save any bad film by virtue of his inexhaustible humor. This theory has been put to the test, as it appears the poor man is destined never to get a script for anything other than a bad movie: Ride Along, About Last Night, Grudge Match – good Lord, Grudge Match! So, while Hart proves his own talent time and again, he’s also proven that no one human man can possibly save every bad movie director Tim Story wants to make. Case in point: Think Like a Man Too. We check back in on all the happy couples of the previous installment as they meet in Vegas for one duo’s nuptials. But first, they will divide on gender lines for bachelor/bachelorette parties. Nothing says fresh like a bachelor party movie set in Vegas. Actually, stale is an excellent word to describe this lifeless retread. Story regurgitates every overused image and idea from about a dozen movies and a lengthy Vegas ad campaign. Do you think there’s an ultra-luxurious suite? How about some glamorous poolside action? Gambling antics? Rain Man mentions? Don’t tell me there are strippers?!! Why, yes, you can expect drunken debauchery (though nothing too raunchy that it can’t be forgiven) that leads to a race to make the ceremony. I swear to God, it wouldn’t have surprised me to find out there was a tiger in the bathroom. You know what might have been interesting? An Omaha wedding. Instead, we get more and more and excruciatingly more of the same, shoveled shamelessly at us in the hopes that Hart can somehow make it funny. Well, he can’t. The man is not superhuman. And that means there’s nothing at all to distract you from everything that is wrong with this film – which is everything. This is the only site that mentions the rain man reference. When Kevin Hart uses it as an explanation to Michael Ealy as to why he should gamble despite the fact that no one wins when they need to in vegas. Ealy, in turn, immediately stops trying to dissuade him and repeats rain man 3 times and yanks his phone out to call him. It feel like there are two different movies going on, meant to be understood by two different groups. Thanks, Lisa. Maybe they were trying to appeal to a variety of audiences and would have been more successful focusing on one.